In this video I show how to make a easy and extremely useful template that can be used year after year to plant your gardens. Last year we decided to start using some of the methods of square foot gardening in order to get the most out of our small raised bed gardens. The whole idea is that all of your vegetables are planted very close together using specific spacing for each variety. This is a much different process than traditional gardening and has many benefits. Planting using a template allows you to have complete control over where each seed goes. This can save seed and does not require anywhere near as much thinning if any at all. All you do is drop one or two seeds (if they are small) into each hole and wait for them to sprout (don't just stand there staring it might take a few days). Once they have sprouted go back and reseed any of the spots that did not sprout. If you save your own seeds then you already know how important it is not to waste seeds. The obvious benefit to using the template is the spacing. You are guaranteed to have perfect rows of vegetables and each will have it's optimum room to grow. 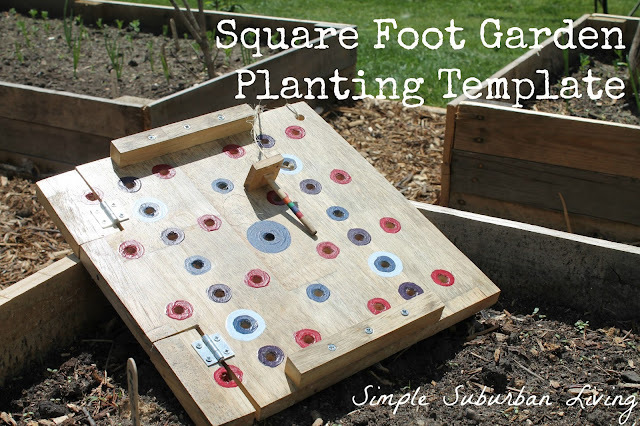 There is a great site that I use each year when I get ready to plant here - http://www.mysquarefootgarden.net/plant-spacing/. There is a list of common vegetables and how many you should plant per square. It also gives you some rules of thumb to use if your plant is not listed there. The most common plant spacing per square foot is 12, 9, 8, 4, 2, 1 and some plants actually take up more than one square foot in which case you don't really need a template. I first designed the template on cardboard and gave it a try to see if it actually helped make planting easier. I was surprised at how much fun it was and the kids loved using it. So, I decided to make a more permanent design. The first step is to get a 12" X 12" piece of wood. Any wood will do but not too thick as you don't want it to be heavy. Once you have your wood cut and sanded start marking grid lines every 3/4" horizontally and vertically. Every fourth line should be a different color (I choose orange). This will give you a 16 square grid to start with. The next step is to mark the spots where holes need to be drilled. I would recommend checking out the video for the best placing. Once the holes are marked you can drill them out using any size drill bit you choose. I used a pea seed as a guide to select mine. I wanted it to be just big enough to fit through as this is one of the larger seeds I normally plant. Next I used a couple of different sized washers to make circles around the holes and then painted them various colors. This will allow you to identify the various seed spacing easily. I then added some handles using a small piece of 3/4" X 6" piece of wood. The next thing that I needed to do was to cut out a section where the template will need to fit around the corner and center support posts in our raised beds. I marked out two 3.5" X 1.5" squares on the bottom two sides and then cut them out. I then used two small hinges to secure the cutout pieces back to the board. This will allow me to move them out of the way when needed and swing them back in to place. Lastly I designed a small push stick using a 1/4" dowel and a square piece of wood as a handle. This was then color coded with markings every 1/4" so that you can easily make holes to whichever depth you need. It also pushes the seeds down tot he proper depth. The template has been working great so far and the best part is it gets our kids excited about planting in the garden!